If you want to avoid nasty diabetic complications, knowing your A1c levels and getting them down to a healthy range (and keeping them there) is critical. 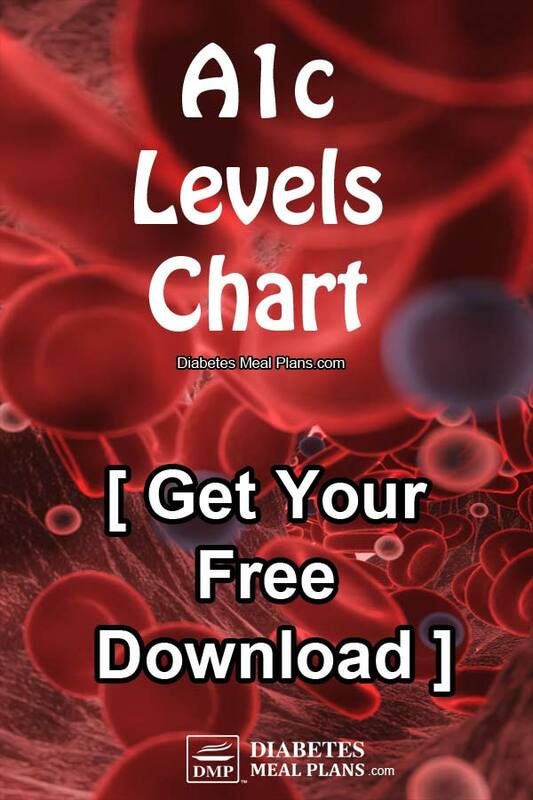 Use the A1c levels charts below to assess your current status. And you can download our free charts at the bottom, too. 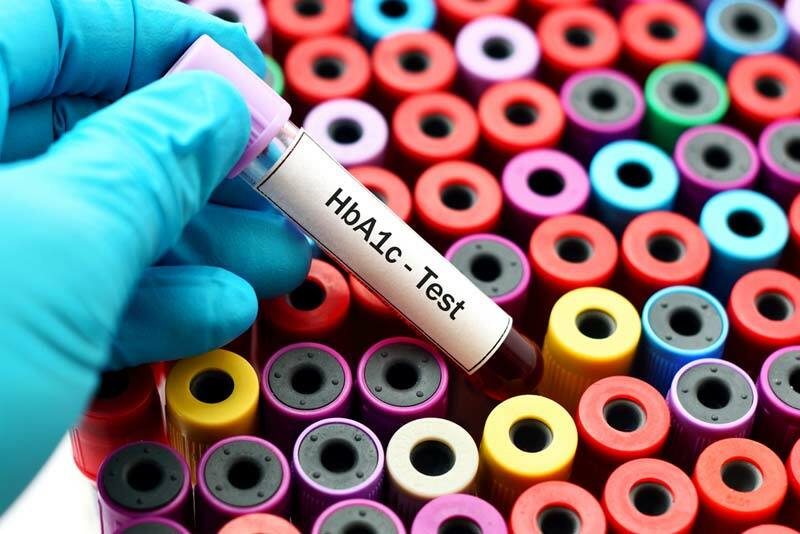 A1c (also seen as HbA1c or Hemoglobin A1c) is a test that provides a snapshot of your average blood sugar levels from the past 2 to 3 months, to give you an overview of how well you're going with your diabetes management. It's a blood test that looks at your red blood cells and how much sugar/glucose is attached to them (glycated hemoglobin). Your A1c result is often expressed as a percentage (%), which can be a confusing at first glance, but it is foundational test that you don’t want to skip out on. The A1c test can be used in conjunction with other tests to diagnose both pre-diabetes and type 2 diabetes. It is also a helpful tool that allows you to objectively track your progress as you try a new medication or implement lifestyle changes. You may be used to taking daily blood sugar measurements or having your doctor measure your “fasting blood glucose” levels, but these serve a different function than the A1c test. Self-monitoring your blood sugar levels on a regular basis is a great way to see how different foods and activities influence your blood sugar control and this lets you know when it’s time to change your treatment plan. Similarly, high fasting glucose levels at the doctor’s office indicate that you may need help with blood sugar control. These two tests paint a picture of how your blood sugar control is going at the present moment, while A1c shows you a larger picture of how your average glucose is doing overall. Now that you’re familiar with the purpose of the A1c test, let’s take a look at what your result actually means. In the United States an A1c in the “normal” range falls under 5.7%, while a measurement of 5.7% to 6.4% may indicate pre-diabetes, and anything over 6.5% is used to diagnose type 2 diabetes. Unfortunately, the guidelines for a healthy A1c are not universal and they vary between regions. In places like Canada, the UK, and Australia, an A1c under 6% is considered “normal,” while values in the range of 6% to 6.4% are indicators of pre-diabetes, and values over 6.5% are a red flag for type 2 diabetes. Ultimately, an A1c goal of 6% is a great goal to work toward. In general, the higher your A1c is, the more likely you are to develop some of the complications of diabetes. So, while an A1c of 7-8% is good, you can still work to get it lower. And very high results in the 9 and 10% range can pose a huge threat to your long-term health. Chronic high blood sugar puts you at risk for complications like nerve damage, kidney damage, amputations, heart failure, and eye problems including blindness. Although this may be alarming to hear, the purpose of this information isn’t to scare you. In fact, we have some great news: you have the power to lower your A1c and reduce your risk for these complications. Lifestyle factors like diet and exercise have a massive impact on your blood sugar and A1c levels, which means that the power to better your health is in your own hands. (Stick around until the end for tips on how to perfect your diet and lifestyle habits). It is understandable that so many people are confused by their A1c results. After all, you get a number written as a percentage that seemingly has no relation to your daily blood sugar levels, plus it doesn’t come in the units you’re used to seeing when self-monitoring your own blood sugar (mg/dL or mmol/L). This is where eAG comes into play. EAG (estimated blood glucose) is the term for a new way to report A1c results—a way that makes a lot more sense. Your eAG is exactly what it sounds like—it is an estimate of what your average blood glucose level would from the past 2 to 3 months, all based on your A1c. 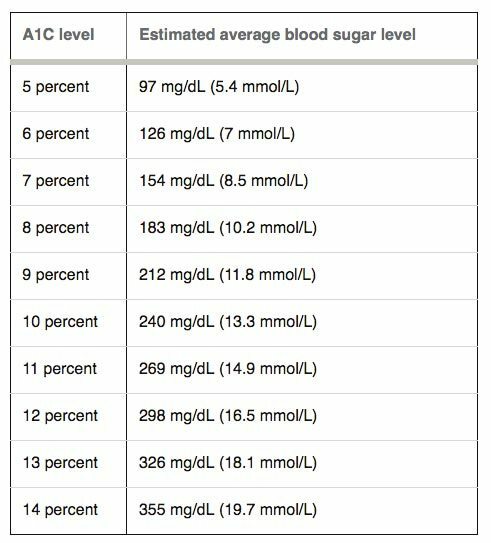 As you can see from the chart below, each A1c level corresponds with an eAG written in the units you may be already used to which makes the result easier to understand. For example, an A1c at 6% is equivalent to an average blood sugar level of 126 mg/dL (7 mmol/L). We can all agree that eAG is a lot more “user friendly” than A1c is, but that doesn’t mean that eAG is without its limitations. Because eAG is just an estimated average, it doesn’t really tell the whole story of what has been going on with your blood sugar during those 2 to 3 months leading up to the test. You could have some major highs and lows that go undocumented because eAG only shows what your average blood sugar level could have been. Like all blood tests, the eAG has its fallbacks, which is why regular self-monitoring in addition to lab testing is so important. You’re going to get the most accurate assessment of your blood sugar stability by combining daily self-monitoring with other tests like A1c and eAG. And speaking of testing, there is one more lab test that your doctor may run in order to get a crystal clear picture of your metabolic health. If your doctor suspects insulin resistance and diabetes, they may order a glucose tolerance test (also known as an oral glucose tolerance test). The results of this test will show how your body breaks down and metabolizes sugar (glucose) and whether or not you have a problem in that area. For this test, you drink a sweet solution containing 75g of glucose on an empty stomach. Then blood samples will be taken at 30 or 60-minute intervals for up to 3 hours after drinking the solution. If you have insulin resistance, your body won’t be able to effectively move all that glucose from the blood stream into your cells, therefore, your blood samples will show high blood sugar levels. If your result doesn’t fall within the normal range then you may have type 2 diabetes or pre-diabetes. Now the question of the hour is: how can you effectively lower your A1c without resorting to medication? You lower your A1c the same way you keep your daily blood sugar levels in check—by adopting healthy diet and lifestyle changes! While it isn’t always easy to make these changes at first, things do get easier the longer you do them. Just focus on fine-tuning your diet, engaging in regular physical activity, and managing stress well. Get moving for at least 30 mins each day – you don’t have to slave over a treadmill for hours or spend hundreds of dollars on a fancy gym membership to get and stay active. Basic activities like walking or at-home yoga are a great way to lower your blood sugar and improve your cardiovascular fitness. Cut down on carbs – carbs are the nutrient that has the greatest influence on A1c levels and most people eat too many carbs. Aim for 50 to 80 grams of “total carbs”(or 30 to 50 grams of net carbs) per day, or at the very most 100 grams per day. Cut out simple sugars and junk food and work towards a clean diet rich in complex carbs, proteins, and healthy fats. If you don't know how to eat this way, join us for weekly meal plans. Manage stress – find relaxing activities that you enjoy and do these thing as often as possible. You could get a massage, listen to uplifting music, walking in nature, write down your feelings, cuddle with a pet, or clear your mind through meditation. Stress directly increases blood sugar levels, and has a negative impact on your body and your mind. Aim for 8 hours of sleep – make whatever changes you need to ensure that you get 8 hours of uninterrupted sleep. Invest in blackout curtains, use earplugs, set up a fan to keep the room cool, whatever it takes! Sleep plays an important role in body restoration and, believe it or not, that beauty sleep has a major influence on blood sugar regulation. Live joyfully – focus on things you are grateful for, find something to laugh about every day, and spent time with loved ones who encourage you. Please share, pin or tweet this info to help others – thanks! Make sure to check out all our free resources available to you, Alba. Thank you for all this useful information. I have had diabetes since 2005 and I am really trying hard to take care of myself. I want to be around for my family and see my daughters grow up. Anybody that has diabetes should follow these suggestions and take it seriously. Start slowly…….but START!! We love empowering our members at Diabetes Meal Plan. Thank you for sharing some motivation, Angelica. For anyone looking for information on where to start making changes, check out this article!